I have made it no secret that my first born has been high maintenance and opinionated since the day she was born. She is stubborn, and at times filled with rage, defiant, independent, sassy, and I’d be lying if sometimes I didn’t think she was the devil incarnate. She is terrible at sharing her toys, refuses bath time nearly every night, tantrums at dinner time, or if she wants a “green” fork instead of the blue one I gave her. She is demanding and bossy. She can make play dates a disaster, car trips a nightmare, and holy hell let’s not talk about restaurants. But you know what else she is? She is smart, and compassionate, and wise beyond her years. She is outgoing and hysterical. She is fiercely protective of her baby sister and stops what she’s doing just to run over to me and tell me she loves me. She is imaginative and full of life. But most importantly; she is mine. She may tantrum over things that are small, but it is my job to remember that to her there are no small things. Every feeling she has is large and all-consuming at three years old. When she is upset because I made fish sticks for lunch and not chicken tenders, my adult brain thinks this is absolutely F-ing ridiculous but then I see the tears in her eyes and the confusion and frustration in her face and body language… and I realize she’s not trying to purposefully make my life difficult… she just feels out of control. And that is something I can relate to. I have noticed something I have been doing that I purposefully and consciously want to stop doing. I have always been self-deprecating and this little quirk has followed me into my parenting. 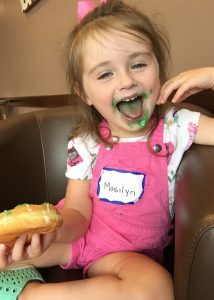 I think I have been apologizing for my daughter’s personality, or making comments like “She is a nightmare!” in settings with other moms for most of her life. I know this is all apart of my self-defense mechanism because it is embarrassing when you have the “bad kid” at the park. Or the kid that won’t share or sit nicely at a restaurant. Because this is one judgmental world we’re living in these days and it’s annoyingly stressful when your kid just won’t behave the way you want them to, dammit! But I realized I don’t want to speak about my child in a negative way or for her to ever hear me speak of her that way. I’d much rather have people judge me for being too soft towards my children than too harsh. The moms that I would judge pre-kids I know now to treat with compassion. It doesn’t feel good to have the “difficult kid” and to feel like everyone is judging your parenting. As a mom of two, the aunt to a niece and nephew, and someone who has been in enough play date scenarios to last me a lifetime… I have learned that parenting only goes so far. At the end of the day… children are individuals with their own temperaments and personalities.